As we hibernate in our warm homes waiting for the defrost of Spring, cold and flu bugs often take this opportunity to jump into action. Between decreased vitamin D levels, lack of activity, and chilly winter winds, circumstances are perfect for developing irritating stuffy noses and painful sore throats. 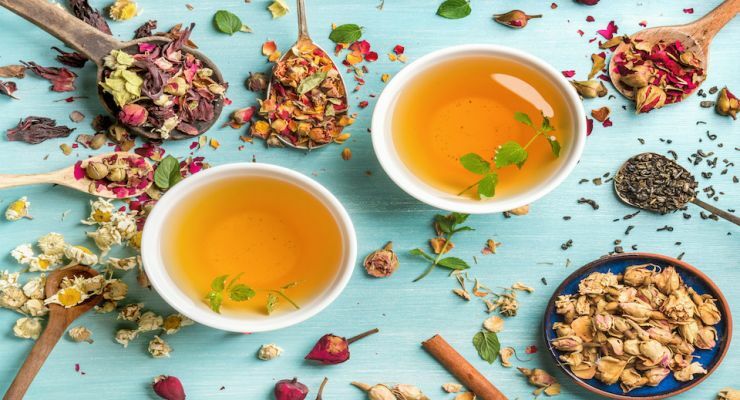 Rather than reaching for that bottle of cough syrup at the first signs of a cold, try utilizing these herbal elixirs to take preventative action and heal your body naturally. These potent tonics pack a serious nutritional punch and are concentrated powerhouses of immune-boosting ability. They’re easy to make and are a great way to get you back on your feet and feeling better in no time. The turning of the calendar often brings increasing stress levels, which leaves your body vulnerable to various germs and bacteria that can turn into lengthy colds. This delicious and zippy tonic can give your immune system the energy boost it needs to fight off those nasty bugs. Cook the lemon peel, turmeric, ginger, and 1 cup water in a small saucepan over high heat until it just starts to boil. Remove from heat and add honey, lemon-balm extract, and lemon juice. Stir well. Strain into a mug and garnish with fresh rosemary, if desired. You can also save the lemon peel and sprinkle it on top of your tonic. Mix ginger, honey, and water in a glass measuring cup. Stir well and let steep 15 minutes. Fill a large two-quart pitcher with ice and pour ginger mixture over it. Add lemon juice and water to fill the pitcher. Sickness can quickly take a toll on energy levels. As your body tries to recover from illness, it can be hard to be motivated and a long day at work is usually the last thing you want to do. Unfortunately, sick days aren’t always an option. This tonic can help give you the kick start you need to get back to work while helping heal your body in the process. The low dose of caffeine from the green tea can keep you alert, and theobromine is essential for improving blood flow to increase concentration. Not only does the cherry juice taste delicious, but cherries have also been shown to soothe sore, tired muscles and reduce inflammation. This tonic is packed full of antioxidants. One sip of this and you’ll be feeling better already. Cook thyme leaves and 1 cup water in a small pot over high heat until it just starts to boil. Remove from heat, add tea bags and steep 4 minutes. Remove tea bags and stir in cherry juice, lime juice, and honey. Add to a mug and enjoy! Note: You can make a double batch of this tonic and save the second serving in the fridge for the next day. Don’t reheat it as it diminishes the green teas antioxidant power. Drink this flavorful tonic at the first sign of a cold to give your immune system a serious shot of energy. Toast coriander seeds and cinnamon stick in a small skillet over medium heat. Toss occasionally for about 4 minutes or until fragrant. Crush carefully on a cutting board and add to a large saucepan. Add 4 cups water and heat on medium. Just let the water get slightly hot. You don’t want it to be boiling. Add remaining ingredients and reduce heat to low. Cook about 15 minutes. Strain and serve in a mug. Save the extra tonic in a large glass jar and keep in the fridge for up to three days. Hey Buddy!, I found this information for you: "4 Herbal Elixirs to Keep You Healthy All Winter Long". Here is the website link: https://www.tropicalhealth.com/herbal-elixirs-healthy-winter-long/. Thank you.